Hannen Swaffer, the eldest of eight children, four boys and four girls, of Henry Joseph Swaffer and his wife, Kate Eugenie Hannen, was born at Lindfield, West Sussex, on 1st November 1879. His father was a draper in Folkestone. Hannen Swaffer went to Stroud Green Grammar School. He left school and got a job with a local newspaper. According to his biographer, Linton Andrews: "An often scornful critic, at the age of eighteen he was banned from the local theatre. 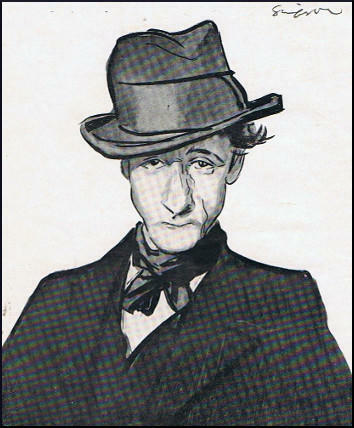 A time came when he boasted of having been banned from twelve of forty-one theatres in the West End of London." Hannen Swaffer joined The Daily Mail in 1902 and worked for Alfred Harmsworth for ten years. For a while he was editor of The Weekly Dispatch. Swaffer also helped to transform The Daily Mirror, from a women's journal into a mass-circulation picture paper. In 1913 Swaffer moved to The Daily Sketch where he started a gossip column. During the First World War he associated with a group of right-wing propagandists, such as Noel Pemberton Billing, Horatio Bottomley, Leo Maxse and Arnold Henry White who claimed that the Unseen Hand were working behind the scenes to obtain a peace agreement with Germany. In 1916 Swaffer helped Billing get elected at the East Hertfordshire by-election. 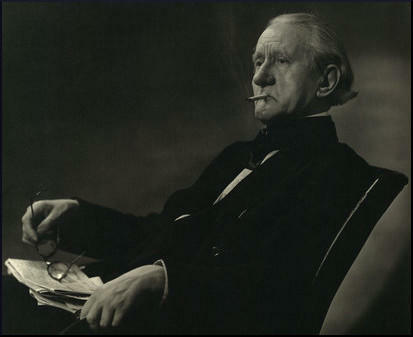 After the war he wrote a gossip page for The Daily Graphic and wrote theatre reviews for The Sunday Times. In 1924 he became editor of The People. Two years later he became drama critic of The Daily Express. Swaffer complained about the over-Americanization of the stage. An actress from the United States slapped his face at the Savoy Hotel "on behalf of America". Swaffer was considered to be one of the most influencial critics in Britain. The novelist, Ethel Mannin, commiserated with Aldous Huxley after he had savaged the play, This Way to Paradise, based on his novel, Point Counter Point (1928). "I asked him if he regarded Hannen Swaffer as a dangerous person. He laughed and said that anyone who had a pen in his hand was dangerous, and as everyone had nowadays, the world was a very dangerous place. 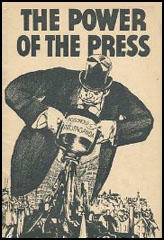 He added more seriously that the power of the press would ultimately sweep civilization back into the dark ages." Tom Driberg got to know Swaffer when he worked for The Daily Express: "Hannen Swaffer, then the dramatic critic, who took me one evening to his regular haunt, the Savoy Grill. Isoon picked up the technique of the standard news story: facts - who, when, where, etc. - in the first paragraph. I was sent out on all the usual jobs: tram accidents, fires, sudden deaths." Hannen Swaffler moved to the left after reading Merrie England, a very influencial book by Robert Blatchford. Converted to socialism he joined The Daily Herald in 1931. His biographer, Linton Andrews, has pointed out: "He often wrote wisely, sometimes like a wiseacre, and always in a clear, homely style. His habit of pontificating on many subjects led him to be termed, to his deep satisfaction, the Pope of Fleet Street.... A kind and witty man, he was known by close friends to be shy under his mask of defiant self-confidence." Swaffer once wrote: "Freedom of the press... is freedom to print such of the proprietor's prejudices as the advertisers don't object to." A supporter of the Popular Front government during the Spanish Civil War he visited Madrid with Emanuel Shinwell, Ellen Wilkinson, George Strauss, Aneurin Bevan and Sydney Silverman. Shinwell later commented: "We were asked to make many speeches to large audiences of soldiers and civilians to encourage them in their struggle. The enthusiasm was there, but I could not help but feel that arms and food would have been of greater value than words if we had only been able to provide them. The most popular speaker was Hannen Swaffer who had years before reported the marriage of Alfonso and Isabella. He invariably took as his theme the contrast between the opulence of the royal court as he saw it then and the miserable poverty of the ordinary people as he now observed it for the first time. The Latin temperament found this type of generalization much more to their taste than a mundane but factual recital of the true facts about the military and political situation." Books by Hannen Swaffer included Northcliffe's Return (1925), Really behind the Scenes (1929), Hannen Swaffer's Who's Who (1929), Adventures with Inspiration (1929), When Men Talk Truth (1934), The Power of the Press (1936), My Greatest Story (1945), What Would Nelson Do? (1946) and Stranger than Truth (1947). 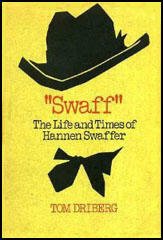 Hannen Swaffer died in University College Hospital, London, on 16th January 1962. While the war was at its height several of us were invited to visit Spain to see how things were going with the Republican Army. The fiery little Ellen Wilkinson met us in Paris, and was full of excitement and assurance that the Government would win. Included in the party were Jack Lawson, George Strauss, Aneurin Bevan, Sydney Silverman, and Hannen Swaffer. We went by train to the border at Perpignan, and thence by car to Barcelona where Bevan left for another part of the front. We travelled to Madrid - a distance of three hundred miles over the sierras - by night for security reasons as the road passed through hostile or doubtful territory. It was winter-time and snowing hard. Although our car had skid chains we had many anxious moments before we arrived in the capital just after dawn. The capital was suffering badly from war wounds. The University City had been almost destroyed by shell fire during the earlier and most bitter fighting of the war. We walked along the miles of trenches which surrounded the city. At the end of the communicating trenches came the actual defence lines, dug within a few feet of the enemy's trenches. We could hear the conversation of the Fascist troops crouching down in their trench across the narrow street. Desultory firing continued everywhere, with snipers on both sides trying to pick off the enemy as he crossed exposed areas. We had little need to obey the orders to duck when we had to traverse the same areas. At night the Fascist artillery would open up, and what with the physical effects of the food and the expectation of a shell exploding in the bedroom I did not find my nights in Madrid particularly pleasant. The famous and gallant defender of Madrid, General Miaja, invited us to dinner at his headquarters in a vault well below the ground. Most of his staff was there, with their wives. I was struck by the Semitic appearance of many of the women and mentioned to the Chief-of-Staff, who was my neighbour, that exactly similar women could be seen any day in London's East End. He told me that in the days of the Spanish Inquisition large numbers of Jews were given the choice of the stake or conversion, and many preferred the latter. We were asked to make many speeches to large audiences of soldiers and civilians to encourage them in their struggle. The enthusiasm was there, but I could not help but feel that arms and food would have been of greater value than words if we had only been able to provide them. The most popular speaker was Hannen Swaffer who had years before reported the marriage of Alfonso and Isabella. He invariably took as his theme the contrast between the opulence of the royal court as he saw it then and the miserable poverty of the ordinary people as he now observed it for the first time. The Latin temperament found this type of generalization much more to their taste than a mundane but factual recital of the true facts about the military and political situation. It is sad and tragic to realize that most of the splendid men and women, fighting so obstinately in a hopeless battle, whom we met have since been executed, killed in action - or still linger in prison and in exile. The reason for the defeat of the Spanish Government was not in the hearts and minds of the Spanish people. They had a few brief weeks of democracy with a glimpse of all that it might mean for the country they loved. The disaster came because the Great Powers of the West preferred to see in Spain a dictatorial Government of the right rather than a legally elected body chosen by the people. The Spanish War encouraged the Nazis both politically and as a proof of the efficiency of their newly devised methods of waging war. In the blitzkrieg of Guernica and the victory by the well-armed Fascists over the helpless People's Army were sown the seeds for a still greater Nazi experiment which began when German armies swooped into Poland on 1st September, 1939. It has been said that the Spanish Civil War was in any event an experimental battle between Communist Russia and Nazi Germany. My own careful observations suggest that the Soviet Union gave no help of any real value to the Republicans. They had observers there and were eager enough to study the Nazi methods. But they had no intention of helping a Government which, was controlled by Socialists and Liberals. If Hitler and Mussolini fought in the arena of Spain as a try-out for world war Stalin remained in the audience. The former were brutal; the latter was callous. Unfortunately the latter charge must also be laid at the feet of the capitalist countries as well.